Whin Whin - -Will it ever Stop !!!!! The snow has been coming down again on and off all week. It's been a very long winter already, but it just keeps on coming and coming and coming!! I am beginning to think that Buckeye Chuck lied to us. 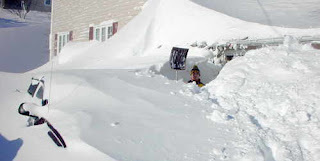 Donna was going to meet her sister and uncle for lunch this week in Mansfield Ohio, but the snow closed the Interstate for several hours and created generally unsafe driving conditions for days. It became a "Don't drive if you can avoid it" period so she wisely stayed at home. Thank God it isn't as deep here as it was in this picture (taken elsewhere) which I have included below. As I whine and whimper about the everlasting winter I am reminded of my post on another blog in July 2008. in that article "The White Note", I introduced what I believe to be a new acronym into English jargon. Follow that link to see the origin of WHIN. But let me go on and WHIN of more recent things. At least the last week has been packed with entertaining events and some things that I can do while confined inside. Valentines Day: By all indications it was a great success. We ventured out to Buccis, a very nice local restaurant, where we celebrated the day along with one of our sons and his date. There we enjoyed good food and the good company. I am still receiving many hugs, smiles, and thank yous. You just can't go wrong letting your spouse know that you love and appreciate them. Winter Olympics: Something to keep couch potatoes occupied. This has been our primary evening activity since the games started. We enjoyed the opening ceremonies and watching most of the events that were selected by the network for prime-time viewing. A new season of Amazing Race. IMHO they haven't managed to totally ruin it yet. I don't think it is nearly as wholesome as the first few seasons but still pretty good. Someone's politically correct agenda is becoming increasingly evident in the selection of participants and gutter language is becoming more frequent, but it is still passable entertainment on a cold winter's night. It is certainly a cut above most of the supposedly "Reality" shows. President's Day: Actually the federal holiday is still legally know as Washington's Birthday even though the date to celebrate it has become flexible. Banks closed, no mail, and kids out of school. The Beginning of the 14 Day Chinese New Year celebration: It fell on Valentine's Day this year. If you are near a Chinese population of any size it is fun to observe the parades and fireworks. In the 12 year cycle of the Chinese zodiac this is the year of the Tiger. In traditional Christian circles Fat Tuesday was the day prior to the beginning of lent. Lent has historically been observed as a time of fasting, and other forms of solemn and pious behavior. Throughout Europe this meant no red meat, no fat, not sweets, no alcohol, and even no sexual activity. In a fit of housecleaning prior to lent and the last minute enjoyment of multiple excesses "Fat Tuesday" celebrations became common. Of course you know about Mardi Gras, and other questionably Christian Carnival celebrations. One less know practice by many with Western European origins is clearing the pantry of sweets and fats by preparation of various sweet treats. Locally the primary purveyors of this tradition are those of Polish Extraction. 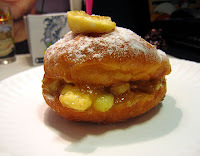 The Polish version of these Fat Tuesday treats, know as PNCSK, is essentially a variety of very, very rich and delicious filled donuts. Of course, being an incorrigible foody, I enjoyed one! 80 years ago (18 Feb 1930) the first cow was flown in an airplane. For the complete story see.